Looking for Lego Marvel Superheroes 2 cheats on PS4, Xbox One, PC & Switch? Here we’ll list Lego Marvel Superheroes 2 cheat codes & unlockables with tips for Traveller’s Tales’s new action-adventure game. Tip: To turn on cheat codes, you first have to be in-game. Next, during gameplay press pause. Like in every Lego game you can enter codes from the Main Menu by selecting “Extras” and then “Enter Code”. After which you can activate the cheat. Or you can go to the Gwenpool’s room in the Avengers Mansion to access the same cheats entering menu via her TV. – Remember that the next time you play the game, you’ll have to activate the cheats again. Note: If you copy these cheats, please link back to this page with credit to us for discovering them on the Giant-Man minifig packaging & at the end of a Lego survey we got! •	“?? ?” Pink Brick — ?????? All versions of Lego Marvel Superheroes 2 get downloadable content (DLC) right away. •	The Out of Time Character Pack DLC is available at launch for free for those who pre-order the Lego Marvel Super Heroes 2 game (varies per country; in North America only at GameStop). It includes: Play as time variant Super Heroes from across the Marvel Universe, including Iron Man 2020, Lady Spider, Nosferata, Captain Assyria, Warmaker, Hulk 2099, and Daredevil Noir. •	The Season Pass DLC is available for everyone at launch as a paid download. •	The Classic Guardians of the Galaxy Pack DLC is available early for those who pre-order the Lego Marvel Super Heroes 2 Deluxe Edition. It includes: Yondu. The other new playable characters are to be confirmed at a later date. Credits: Lego Survey, Jojopet, Mike & Razor. Until more Lego Marvel Superheroes 2 cheats are discovered, we made the handy Lego Marvel Superheroes 2 guides listed above to help you with tips and tricks for the game! 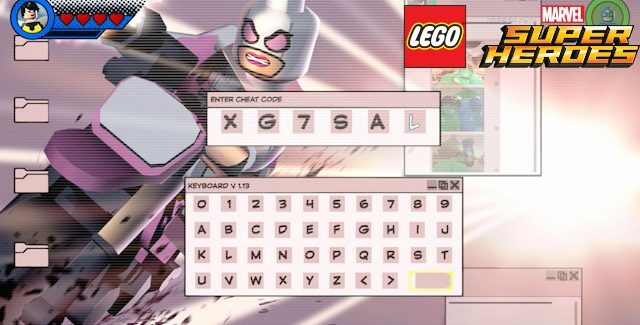 Do you know of any Lego Marvel Superheroes 2 cheats or unlockables?